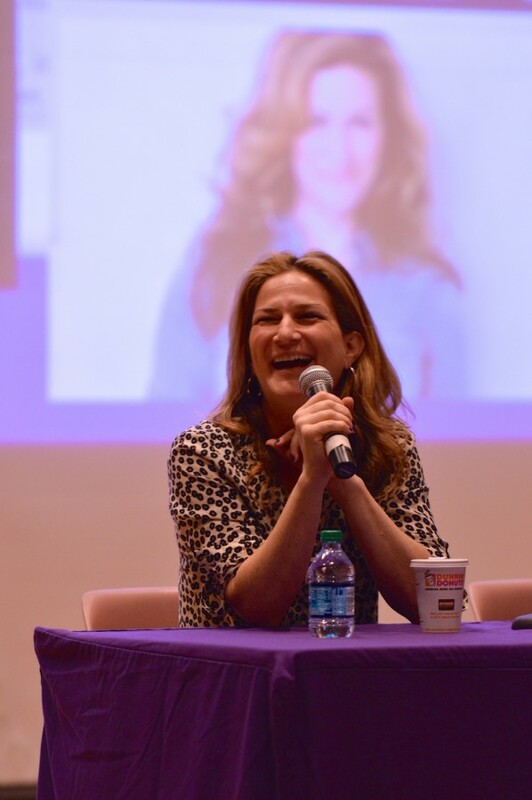 Homecoming Grand Marshal Ana Gasteyer (Communication ‘89) addresses the audience in Norris University Center on Friday. Gasteyer spoke with a panel of Northwestern alumni about their professional lives after graduation. Five Northwestern alumni spoke on Friday about life after NU in a panel led by University President Morton Schapiro. The panel, titled “Who Are You Because of NU?” was organized by the Office of Alumni Relations and Development and student organizers as part of Homecoming Week. It was the sixth annual event that Schapiro has moderated, said Eric Horner (Weinberg ’97), director of reunion programs, alumni relations and development. Alumni Relations and Development organizes the event and offers a list of about 15 alumni who are successful in their various fields, from which Schapiro ultimately selects the panelists, said Robert McQuinn, vice president for Alumni Relations and Development. The event, held in Norris University Center, featured alumni from a variety of backgrounds: Jim Kackley (Weinberg ’64), previous president and chief operating officer of Orion Energy Systems Inc.; Terry O’Neill (Weinberg ’74), president of National Organization for Women; Ana Gasteyer (Communication ’89), former Saturday Night Live cast-member and Homecoming Grand Marshal; Harreld N. Kirkpatrick III (Weinberg ’94, Kellogg ’97), founding partner and co-CEO of Vistria LLC; and Madhuri Kommareddi (Weinberg ’04), current director of program development for the Office of Hillary Rodham Clinton at the Clinton Foundation. The speakers urged current students, alumni and faculty members to maintain humility in the professional environment, to appreciate the community created by NU and to work to better the world while attaining professional success. Kackley, a University trustee, said students need to be careful about taking on too many obligations and should make time for thought and independent reading. Communication freshman Matthew Burgess agreed with Kirkpatrick’s description of the school. Burgess, who expected “a boring alumni panel,” said the event helped him to understand how connected the community is. After the event, Kommareddi told The Daily she hoped attendees realized that not all students need to immediately know their career plans. “You have to have confidence that even if you are not following the path that you think you should be on or the path that you see others on, that’s okay because everyone becomes who they are in a different way and it’s going to be okay,” she said. Horner said he was pleased with the event. “Our alumni responded and said they really liked it and thought this was the best it’s been,” he said.